Trevone Boykin runs into the end zone for one of his 3 touchdown runs to lift TCU over Kansas State. You gotta love November football in the era of the playoff! Every week it seems like there is an elimination game. This week, the 7th ranked Kansas State Wildcats and the 6th ranked TCU Horned Frogs faced each other, with the winner having a chance at the playoffs and the loser likely out of the playoff picture. After a come from ahead loss to Baylor, TCU has been red hot. Last week they escaped Morgantown, West Virginia with a win over the Mountaineers and they were ready for a home game back in Texas. Three weeks ago, the Wildcats knocked off Oklahoma and they were tied with TCU for the lead in the Big 12. Midway through the 1st quarter, TCU QB Trevone Boykin got the Horned Frogs high octane offense going. He connected with junior receiver Josh Doctson for 20 yards and senior receiver David Porter to put TCU in the red zone. Boykin ran it in from the 2 yard line and TCU was up 7-0. On TCU’s next possession they quickly scored again, moving 58 yards in 7 plays. Boykin connected with Porter from 10 yards out to take a 14 point lead. Kansas State quickly answered with a 70 yard completion from junior quarterback Jake Waters to senior receiver Tyler Lockett to cut the lead to 14-7 at the end of the 1st quarter. The two defenses stepped up in the 2nd quarter and began to start forcing punts. The only score of the quarter was a 26 yard field goal by TCU kicker Jaden Oberkrom just before the half to extend the Frogs lead to 17-7 at the half. On the opening kickoff of the 2nd half, TCU junior receiver Kolby Listenbee gave the Frogs good field position by returning the kick 40 yards. The Horned Frogs took advantage of the good field position and Boykin moved his team 60 yards in 5 plays with the score coming on a 19 yard run by Boykin where he was hit inside the 5 yard line and he somersaulted over the tackler into the end zone. 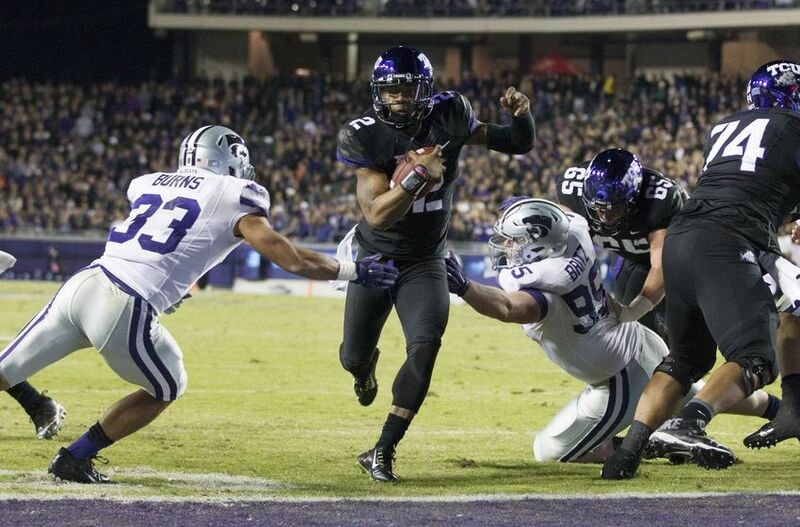 Boykin is starting to gather some steam as a possible Heisman candidate. To win the award, you have to have a “Heisman moment”, a play that makes you say “Wow!”. This play could very well have been his Heisman moment. Leading 24-7, you would think the game was over, but the pesky Wildcats cut the lead to 10 points when Waters hit senior receiver Curry Sexton from 15 yards out with still a quarter and a half to go. TCU struck right back though. Nebraska transfer Aaron Green had a highlight reel 65 yard run for a touchdown. Green broke several ankles on his amazing run, which extended the Horned Frogs lead to 31-14. On the first play of the 4th quarter, Oberkrom again hit from 26 yards out to extend TCU’s lead to 34-14. Midway through the quarter, Boykin got loose again and scored from 23 yards out to make the score 41-14. The Wildcats added a garbage time TD run by backup QB Joe Hubener to make the final score 41-20. The lopsided win over a top 10 team vaulted TCU into the #4 spot in this week’s playoff projection. The Horned Frogs now control their own destiny. If they can win out against Kansas, Texas and Iowa State, they should lock down one of the four playoff slots. Kansas State suffered their second loss of the year and are likely done as far as getting into the playoffs. They also end the season against #7 Baylor, so their schedule doesn’t get a whole lot easier. Trevone Boykin, QB Jr (6-2, 205): Has blossomed under the coaching of offensive coordinator Sonny Cumbie. Thriving in the new offense. At his best when he is loose and creating on the run. Attacks the defense with his running style and his ability to hit the deep pass. Runs the option very well. Eludes the rush and extends plays with his feet. Spreads the ball around to multiple receivers. Has a gun for an arm, but he is also able to drop the ball in between coverages. Has great feet and is very quick and fast. Sees the field well when he’s running the ball and also is able to find his second and third receiver. Has a nose for the end zone and doesn’t mind giving up his body for the score. A great ball handler that can fake out the defense. Completed 23 of 34 for 219 yards and 1 TD. Ran 17 times for 123 yards and 3 scores. Aaron Green, RB, Jr (5-11, 202): Transfer from Nebraska. Got the start due to an injury to B.J. Catalon. Has great feet and is very slippery. Has a darting running style. Runs hard and gives good effort. Has a great jump cut to change direction very quickly. Has ability to juke defenders and is electric when he gets into space. Led the team with 171 yards rushing on 18 carries and had a highlight reel 65 yard touchdown run. Kolby Listenbee, WR, Jr (6-1, 183): Having the best year of his career. Has the size to go up and get the ball at the highest point. Sprinters speed and also has the ability to break tackles. Makes diving catches. Great concentration. Shields off defenders with his body. Able to return kicks. Had 6 catches for 31 yards and had a 40 yard kickoff return. David Porter, WR, Sr (6-0, 197): Got the start with Deante’ Gray injured. Makes catches in a crowd. Good field awareness. Runs good routes and knows how to get open. Strong hands. Very good concentration. Had a big game, leading the team with 7 catches for 84 yards and 1 TD. Had a 34 yard reception. Ja’Juan Story, WR, Jr (6-4, 208): Big body. Transfer from Florida. Still developing. Good route runner. Had 2 catches for 21 yards. Josh Doctson, WR, Jr (6-4, 190): Good size. A tough player that is playing on a bum ankle. Has good chemistry with Boykin. Good stiff arm when he’s in the open field. Finds soft spots in the zone. Had 4 catches for 53 yards. Chucky Hunter, DT, Sr (6-1, 305): Big, tough player that is good against the run and the pass. Able to push the pocket on passing downs. Had 2 tackles and 1 QB hurry. Paul Dawson, OLB, SR (6-2, 230): Playmaker. True 3 down linebacker. Able to blitz or drop into coverage. Plays downhill and wraps up ball carriers. Had 4 tackles, 2 QB hurries and a tackle for loss on 3rd down that forced a punt. Kevin White, CB, Sr (5-10, 174): Has ability to shut down the opponent’s top receiver. Aggressive player that sometimes bites on double moves. Had a tough game. Had 5 tackles and 2 pass breakups. Was beat on a 70 yard touchdown and called for a pass interference penalty. Chris Hackett, S, Jr (6-2, 195): Versatile player that does well playing the run or the pass. Always around the ball. Good blitzer. Very good ball skills. Athletic and has a very good vertical jump. Led the team with 5 tackles and had a 3rd down stop that forced a punt. Had an interception in the end zone that was returned 30 yards. Sam Carter, S, Sr (6-1, 215): Versatile safety. Does a good job in man coverage. Has the ability to cover slot receivers. Had 3 tackles and 1 pass breakup. Jake Waters, QB, Jr (6-1, 210): Tough player that is playing with a shoulder injury. Lacks the size of his predecessor Collin Klein, but he runs the same offense. Recruited as a pocket passer, but has learned to run QB power run plays. Makes good decisions and had 0 INT for the season coming into the game. Does a good job reading progressions and checking the ball down. Has good pocket presence. Nice touch on the ball. Completed 20 of 37 for 291 yards, 2 TD and his first INT of the year. DeMarcus Robinson, RB, Sr (5-7, 209): Short and stout. Has a low center of gravity and does a good job hiding behind his offensive line. Good change of direction. Quick acceleration. Exploits small creases. Led the team with 7 carries for 21 yards. Curry Sexton, WR, Sr (5-11, 183): Good concentration. Very good footwork. Good speed. Had 4 catches for 114 yards and 1 TD. Had a 74 yard catch. Tyler Lockett, WR, Sr (5-11, 175): Game breaker. Speed to run right past defenders. Snatches the ball from the air. Dangerous in space. Became Kansas State’s all-time leading receiver in this game. Able to return kicks. Led the team with 11 catches for 196 yards. Had a 70 yard TD catch. Had a 91 yard kickoff return negated by penalty. Zach Trujillo, TE, Sr (6-5, 256): Has the ability to line up tight or flex out into space. Good blocker. Comes back to the ball well. Had 2 catches for 39 yards. Cody Whitehair, LT, Jr (6-4, 309): Strong base in pass protection. Does a good job dominating defenders in the run game. Ryan Mueller, DE, Sr (6-2, 245): Former walk on. Worked his way into the starting lineup and has become one of the Big 12’s best pass rushers. Was second in the Big 12 in 2013 with 11 ½ sacks, but only has 3 ½ this year. A bit small for an NFL defensive end. Had 4 tackles and ½ tackle for loss. Valentino Coleman, DT, Sr (6-2, 285): Gets a good pass rush. Pushes the pocket and gets in the face of the QB. Ties up the middle of the line. Knows how to get his hands up to affect passes. Had 2 tackles and 1 pass breakup. Travis Britz, DT, Jr (6-4, 293): Active player with a good motor. Pursues plays all the way to the sideline. Knows how to get into passing lanes and gets his hands up. Had 7 tackles and 1 pass breakup. Randall Evans, CB, Sr (6-0, 190): Does a good job defending the run. Plays with good containment. Very quick. Fights through blocks and makes tackles. Had 8 tackles, 1 ½ tackles for loss and 1 pass breakup. Morgan Burns, CB, Jr (5-11, 195): Feisty. Fights for the ball while it’s in the air. Able to return kicks. Had 4 tackles and 2 pass breakups. Danzel McDaniel, CB, Jr (6-1, 205): Physical corner that is good at man coverage. Has the ability to return punts. Had 9 tackles. This entry was posted on November 12, 2014 by draftmaniacs in Scouting reports and tagged 2015 NFL draft, Aaron Green, Chris Hackett, Chucky Hunter, Cody Whitehair, Curry Sexton, Danzel McDaniel, David Porter, DeMarcus Robinson, Fear the Frog, Ja'Juan Story, Jaden Oberkrom, Jake Waters, Josh Doctson, Kansas State football, Kevin White, Kolby Listenbee, Marcus Mallett, Morgan Burns, NFL, NFL Draft, Paul Dawson, Randall Evans, Ryan Mueller, Sam Carter, TCU Horned Frogs, Travis Britz, Trevone Boykin, Tyler Lockett, Valentino Coleman, Zach Trujillo.